(The instrument shown above is a 1983 Guild archtop, Duane Eddy Model DE-500 – FM. The pickups were most likely assembled by DeArmond, using older stock components, such as the gold-plated CF Martin archtop pickup housings for neck and bridge. The white coil formers are probably standard Model 2000 types, as previously used by Guild. (Photo copyright Kevin of Retrofret Vintage Guitars, Brooklyn, NY, USA (B0289)). The Guild Guitar Company was founded in 1952 by Alfred Dronge, a guitarist and music-store owner, and George Mann, a former executive with the Epiphone Guitar Company. The company was initially based at 536 Pearl Street, Manhattan, where the first instruments were produced in 1953. In 1956, the company moved to Hoboken, New Jersey. The new premises quadrupled the workspace to 6,000 sq. feet. In 1967, the company moved again, to Westerly, Rhode Island. Fender Musical Instruments Corporation purchased Guild in 1995. In 2014, the company was acquired by the Cordoba Music Group. The Guild Guitar Company used a number of DeArmond guitar pickups. The standard Model 2000, finished in chrome, usually with a white coil former, was used in the Starfire and other instruments. This recessed version of the DeArmond Model 210 attachable pickup in chrome with a white coil former was fitted in this Starfire I. 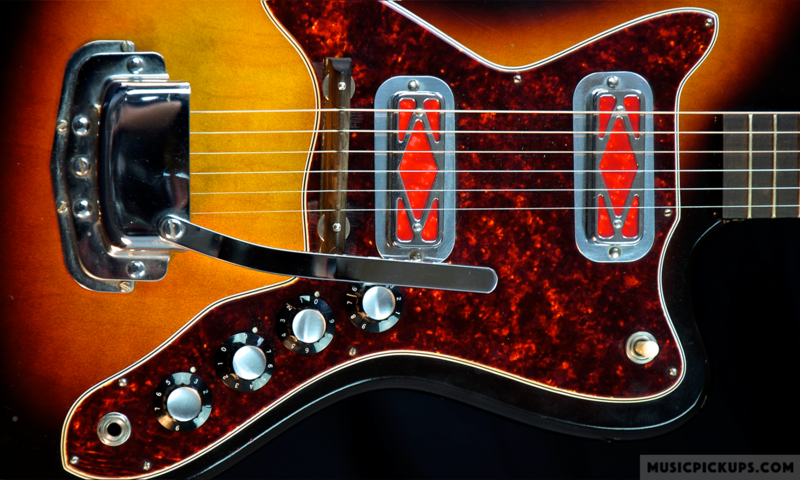 The 1970s Guild X-175 above was fitted at one time with a slight variation on the standard model 2000 pickup, in that its metal base flange was concealed under a bevelled black bezel, with just two fixing screws, each centred on the pickup’s short side. The Guild Artist Award guitar was marketed with an optional single pickup, above. For a period Guild offered a Model 1000 Rhythm Chief pickup with this instrument. A volume controller pot was fitted to the edge of the pickguard’s underside. The pickup’s insert was engraved ‘Guild Artist Award by DeArmond’. The lettering in this front panel is in Harry DeArmond’s own handwriting. Chrome-plated pickups had either a white insert with black lettering or black insert with gold lettering. This pickup was screwfixed to the side of the neck by means of the standard DeArmond short offset arm. A faint vertical line is visible on the extreme Right Hand side of this pickup’s front insert. This is intended as a guide to positioning the pickup. The first string should be located directly over this line. This 1964 Guild Johnny Smith guitar (in the two photos above) is shown with the DeArmond Artist Award pickup in chrome with a black insert. The DeArmond volume controller pot with screwed connection and tapered conical transparent knob is shown attached to the lower Right Hand side of the pickguard (B0556).